Carbon monoxide (CO) is generated wherever combustion occurs, including the operation of gasoline engines, as well as heating and cooking appliances. It is invisible, odorless, tasteless, and deadly. Faulty venting or even a wind shift can create a dangerous situation, particularly in confined areas like boat cabins. 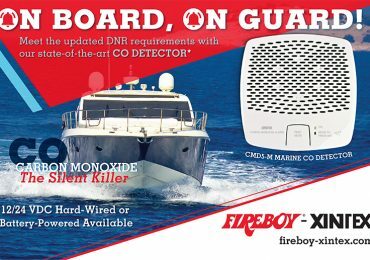 Typical symptoms of CO exposure can be mistaken for the flu or seasickness, making accurate on board CO detection a necessity. The CO Alarm uses a microprocessor to measure and accumulate CO levels. Using the principle of “Time Weighted Averaging” (TWA), the CO Alarm monitors CO concentration, temperature, and time to calculate levels of Carboxyhemoglobin (COHb). COHb is the degree to which the oxygen carrying capacity of the blood is impeded by the union of carbon monoxide to the hemoglobin and is expressed as a percentage. In simpler terms, our bodies prefer absorbing CO to oxygen, and COHb is the ratio of absorbed carbon monoxide to oxygen in the bloodstream. The CO Alarm calculates this COHb as a function of time and determines the appropriate alarm time. 200 PPM: Slight headache within 2 to 3 hours. 400 PPM: Frontal headache within 1 to 2 hours. 800 PPM: Dizziness, nausea and convulsions within 45 minutes. Insensible within 2 hours. 1,600 PPM: Headache, dizziness and nausea within 20 minutes. Death within 30 minutes. 3,200 PPM: Headache, dizziness and nausea in 5 to 10 minutes. Death within 30 minutes. 6,400 PPM: Headache and dizziness in 1 to 2 minutes. 12,800 PPM: Death in less than 3 minutes.